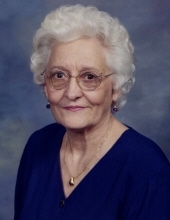 Mrs. Carrie Elizabeth Joyner Clark, 93, passed away on Monday February 4, 2019. A graveside service will be conducted on Friday at 3:30 pm in Pinewood Memorial Park. A native of Greene County, Mrs. Clark was born to the late Josiah Carson and Julia Smith Joyner. She worked as a bookkeeper for many years for The University Book Exchange. As a child of a farming family during the depression era, Mrs. Clark will be remembered for her core family values and strong work ethic. She was a great wife and mother who really enjoyed attending to the needs of her family. She had a lifelong passion of following her children and grandchildren’s sporting activities and she continued to attend baseball games at Elm Street Park, even in her later years. In addition she enjoyed playing bridge with her regular group for several decades. She was the gregarious sort and could strike up a conversation with anyone, and did. She will be greatly missed by many who knew and loved her. She is survived by her sons, William Layton Clark, III and Joel D. Clark and wife, Gail, all of Greenville; grandchildren, Caroline E. Clark of Wilmington, Joel D. Clark, Jr. (J.D.) of Greenville, Carson W. Clark of Bowling Green, KY and Gracen E. Clark of Wilmington; sister, Julia J. Harper of Snow Hill; and several nieces and nephews. The family will receive friends from 2 – 3 pm before the service at Wilkerson Funeral Home. To send flowers or a remembrance gift to the family of Carrie Elizabeth Joyner Clark, please visit our Tribute Store. "Email Address" would like to share the life celebration of Carrie Elizabeth Joyner Clark. Click on the "link" to go to share a favorite memory or leave a condolence message for the family.